So, I use a Bluetooth mouse and keyboard with my computer. If I don't want to lose control of them while Dolphin is running, is it possible to connect a second Bluetooth adapter and have Dolphin use only that one? @wowfunhappy - Yes you can have two bluetooth adapters, one for bluetooth and another for bluetooth passthrough for dolphin. Just be careful when installing LibUSB! I have three bluetooth adapters in my system, so I know all about it. Sooo, I have the Dolphin bar but I also have an old bluetooth dongle. Could I use the dongle for passthrough and the Dolphin bar just as sensor bar or will the Dolphin Bar always interfere with the bluetooth stuff? Oh man, and here I thought the DolphinBar was going to be the be-all end-all solution for using my Wii Remotes. 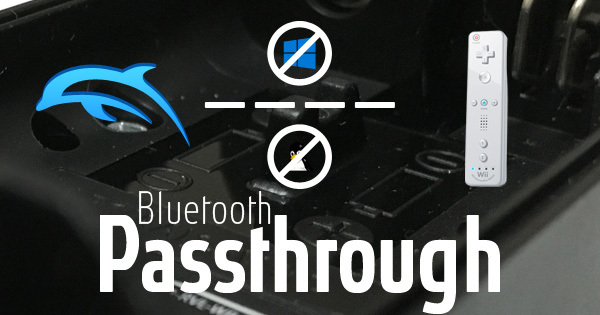 Now you guys got me thinking of buying another Bluetooth adapter to do Bluetooth passthrough! (10-24-2016, 04:05 PM)StripTheSoul Wrote: Could I use the dongle for passthrough and the Dolphin bar just as sensor bar or will the Dolphin Bar always interfere with the bluetooth stuff? Dolphin Bar won't interfere with Bluetooth Passthrough, however, if you've updated the firmware of your Dolphin Bar to v3 or later then you can't use it just as a sensor bar anymore because it'll only turn the IR LEDs on if there's at least one Wiimote connected directly to it. Hmm, syncing doesn't work for me (yes, game was running). Not sure I used that Zadig tool correctly. It only said "Generic Bluetooth Radio" (no other Bluetooth devices present at that time, also no dolphin bar), I chose WinUSB (blabla version numbers) and replaced the driver... what did I do wrong? I just click sync and press 1+2 on the wiimote, right? You need to press sync in Dolphin and sync on your wiimote to get them paired. After pairing you never need to worry about that again, and can just press A while a game us running and it works!